Increased globalisation since the mid-1990s has eroded some of the tax bases of many economies. At the same time, demand for public goods has risen and governments face the challenge of financing greater public expenditure with lower tax revenues. This column discusses tax policy responses to increasing globalisation, showing that since the mid-1990s governments in OECD countries have increasingly relied on revenues from employee-borne rather than firm-borne taxes. Due to the greater mobility of capital and high-skilled workers, who are able to escape higher taxes more easily, the middle classes have carried much of the additional tax burden. With increasing openness in terms of both goods trade and factor mobility, governments face two challenges. First, the demand for and consumption of public goods rises (Rodrik 1998, Epifani and Gancia 2009) partly because the desire and need for insurance against the exposure to economic shocks increases. Second, the erosion of some tax bases due to their mobility across national borders, and thereby their capability to escape high national tax rates, forces governments to lean more heavily on relatively immobile bases and reduce the tax rates on mobile bases (Devereux et al. 2008, Kleven et al. 2014). One result of this process is that a higher level of public expenditure must be financed by an ever smaller range of tax bases. Over the past quarter of a century, several governments repeatedly ran fiscal stimulus programmes to counterbalance global shocks, while at the same time, tax rates on mobile bases – such as corporate profits – came down quite significantly. It is well known that, much like capital, high-income (mostly high-skilled) individuals have become more internationally footloose, and, according to economic theory, this should have led governments interested in attracting or retaining such individuals to reduce their relative tax burden. In a new paper, we show that governments in the OECD – but less so elsewhere – fundamentally changed their responses in taxation to the increase in cross-border trade and migration (Egger et al. 2016). While increased openness went hand in hand with greater labour income tax progressivity between 1980 and the mid-1990s, it is the middle classes that paid for the openness-induced change in labour income taxation after 1994. This effect is not due to cold progression (the mechanical increase in taxation across all labour incomes in progressive tax systems due to inflation) or the increase in the dispersion of gross labour incomes, but largely to changes in the progressivity built into personal labour income tax systems. Between 1994 and 2007, the average OECD economy responded to higher openness by placing a higher tax burden on the relatively immobile middle-income classes, increasing their labour income taxes by 1.5 percentage points, all while lowering average tax rates for earners in the top percentile of the labour income distribution by 1.5 percentage points. Most countries experienced a steady growth in the cross-border flow of goods and production factors over the past decades. 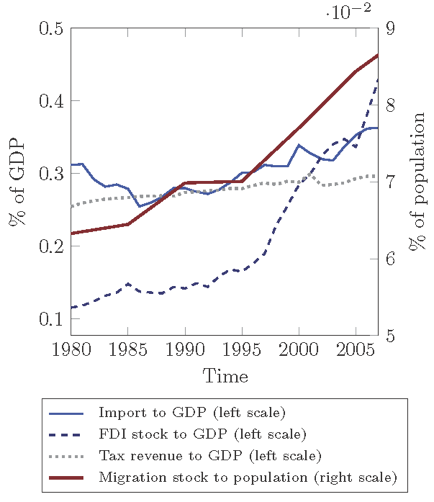 Figure 1 illustrates that, between 1980 and 2007 and among the 65 biggest economies, the import-to-GDP ratio of an average country increased by more than 16%. Identical trends are observed in the data on inward foreign direct investment (FDI) and immigration stocks. In the same figure, we observe that during the same time period total government tax revenues increased by 16 percent. 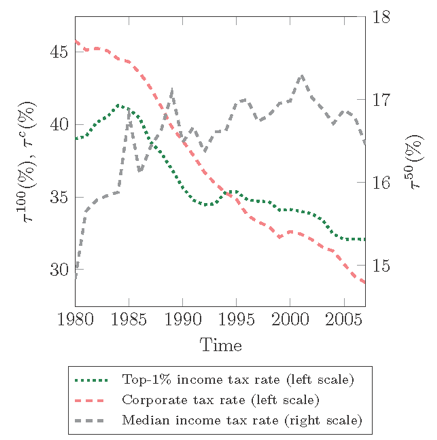 Rising government tax revenues were concurrent with reductions in corporate tax rates, as shown in Figure 2. This is consistent with the well-established result of a negative relationship between tougher global competition for firms and investments and corporate tax rates (Devereux et al. 2008). However, with few exceptions, we know very little about whether and how countries engage in tax competition for labour. 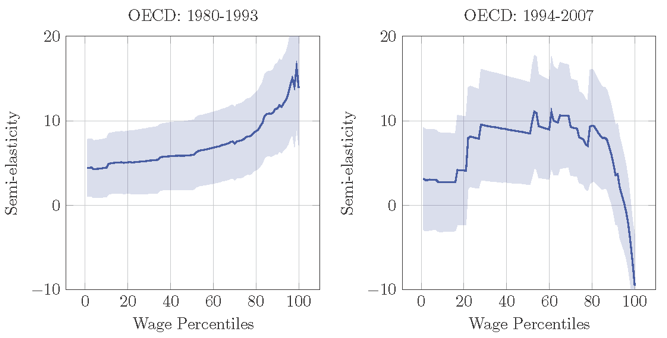 Figure 2 also plots the effective average labour income tax rates for workers in the median and the top 1% of the earnings distribution. It turns out that, much like corporate taxes, labour income taxes for very high incomes have declined significantly since the 1980s. However, this was not the case for the median worker, who in 2007 faced a higher (by 2 percentage points) tax rate than in 1980. We argue that the differences in the tax trends of those in the middle and those at the top of the earnings distribution can be largely explained by governments' responses to globalisation, namely by levying higher tax rates and tax burdens on the (relatively immobile) middle classes than on individuals in the upper tail of the labour income distribution. In response to the globalisation-induced competition over capital and high-income labour, governments compensated the otherwise forgone revenues by taxing less mobile bases more heavily. Inter alia, this led to higher personal labour income tax rates and burdens for earners in the middle classes, in particular, in the OECD. This result emerged from an in-depth analysis of the percentile-specific changes in effective personal labour income tax rates and even personal labour income tax calculators across the 65 largest economies for the years 1980 to 2007. In our paper, we show that gross-of-tax personal labour income distributions at the percentile level could be approximated relatively well with Pareto or log-normal distributions, with the latter performing slightly better than the former according to comparisons with available micro-data in the Luxembourg Income Study. The obtained detailed country-year-specific labour income distributions were fed into the most comprehensive, existing set of personal labour income tax calculators, collected by the authors, to calculate effective average labour income tax rates inclusive of all employer-based taxes and social security contributions and exclusive of all permitted deductions applicable to an average single male earner.1 This exercise obtained distributions of net wages as well as of effective average tax rates across all percentiles, countries, and years. These variables were then used to assess the causal impact of globalization on taxation, where globalisation was instrumented by pure trade and migration costs consistent with structural models of trade and migration. We find quantitatively important effects for OECD countries (and no effect for non-OECD countries) that differ starkly across two time periods: 1980-1993 and 1994-2007. In the mid-1990s, globalisation took off at a new pace, stemming from the complete elimination of artificial barriers to free movement of goods (e.g. in NAFTA), workers, and people (e.g. in the Schengen area) in a significant part of the developed world. Previously, the mobility of factors and goods was rather limited, and governments responded to globalisation in the way the literature on optimal taxation theory in closed economies predicts (Saez 2011), namely, an increased progressivity of the tax schedule accompanies greater openness. This is depicted in the left panel of Figure 3, where we plot the estimated semi-elasticity of percentile-specific tax rates to openness with a 90% confidence band. The effect is increasing in relative labour income such that high-income earners faced relatively higher openness-induced increase in tax rates than the low- or middle-income classes up until the mid-1990s. However, when goods and factors became relatively more footloose after 1994, evidence suggests that OECD governments found it more difficult to tax (arguably highly mobile) high-income earners. 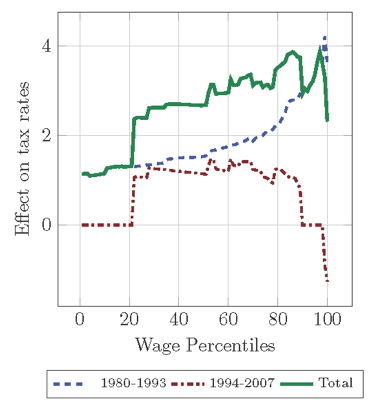 Moreover, in light of competition for such often high-skilled individuals, countries have further sought to decrease those individuals' personal income tax rates and compensated the foregone revenues by increasing taxes on individuals with middle incomes (and lower bargaining power than high-income earners), which is evident from the right panel in Figure 3, where the estimated semi-elasticity is concave with respect to earnings percentiles. This effectively means that, under the threat of flight of high-skilled workers, governments reduced taxes for mobile high-income earners and increased them for the immobile middle- and upper-middle-income classes. This result is consistent with models of optimal taxation featuring migration (Lehmann et al. 2014). The cumulative effect of globalisation on effective average labour income tax rates was non-negligible between 1980 and 2007. In Figure 4, we plot the calculated, cumulative effect of openness on personal labour income taxes in 1980-1993, 1994-2007, and the total over the whole time span. Due to higher openness between 1980 and 2007, workers at the centre of the labour income distribution saw their effective average tax rates increase by 3-4 percentage points, whereas those at the bottom and the top 1% of the earnings distribution experienced an increase by only 1 and 2 percentage points, respectively. This polarisation mainly took place in the later half of the sample period (1994-2007), when governments lowered employee-based taxes by 1.5 percentage points for the very high incomes in order to retain or attract a highly qualified, high-income workforce, while raising taxes by 1.5 percentage points for the middle classes. This is in stark contrast to the years before 1994, where an average OECD government responded to higher openness with higher progressivity and increased tax burden on workers with higher labour income. In our paper, we establish similar results in a case study where we use interstate worker mobility in the US and micro-data on income and personal income taxes at the sub-national level. According to the Pew Research Center Survey conducted in 2014, around 60% of respondents in both rich and poor countries saw growing inequality as a major challenge. However, reducing inequality through more progressive labour income taxation may not always be feasible as increasing mobility of high-income – and often highly skilled – individuals constrains governments' ability to tax them. We show that between 1994 and 2007 OECD, countries responded to globalisation by increasing taxes for the middle classes and decreasing them for high-income earners. Hence, under the pursuit of retaining and attracting highly productive, high-income workers, the goal of reducing inequality via conventional tax instruments becomes increasingly challenging. Overall, personal income taxes have become less powerful a tool for redistribution since the mid-1990s due to globalisation for the members of the OECD. International tax policy coordination in capital taxation is on the agenda of academic and policy research. It might be worth exploring the costs and benefits of such coordination on the taxation of labour as well. Egger, P H, and N Strecker (2016), “A Tour of Income Tax in the World, 1980-2012”, ETH Zurich mimeo. Pew Research Center (2014), “Emerging and Developing Economies Much More Optimistic than Rich Countries about the Future”. The tax calculator data set covers 252 economies and territories around the globe at an annual level between the years 1980 and 2012 for 12 household archetypes (distinguished by the types of allowances and deductions granted across all the existing systems). For further details, see Egger and Strecker (2016). The limiting factor for the economic analysis are data on gross labor income distributions and education shares in the population across countries and time which led to a focus on 65 economies and the years 1980 to 2007.